Advocate of the High Court and Supreme Court Fadzayi Mahere now has an online automated personal assistant that will be helping in her campaign to represent Mt Pleasant Constituency in the Parliament. Shandu (short for shanduko -which translates to change), is indeed a shift from the norm when it comes to campaign strategy. 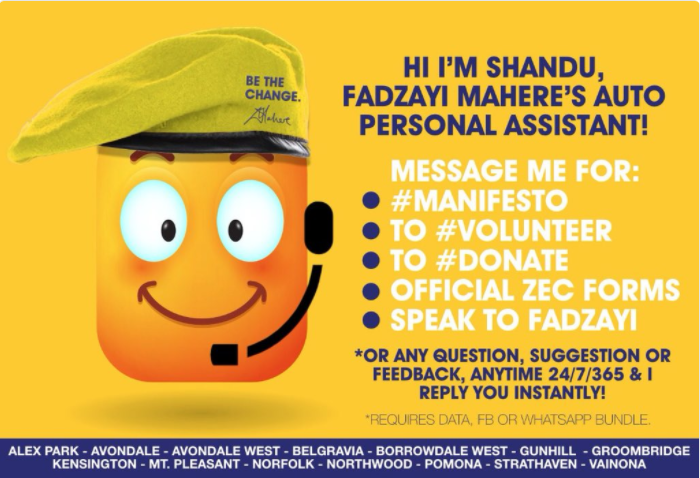 Shandu is a bot that will respond to people seeking info about what Mahere will bring to the constituency if elected as MP during the upcoming elections. The bot can send you a PDF of Fadzayi’s manifesto containing what she intends to do if she gets the vote. Shandu can also assist users who want to volunteer to be part of her campaign along with those who want to donate to the campaign. Simple and straightforward. For now, the manifesto will be downloadable in 2 languages: Shona and English. Knowing that there would be questions as to why there is no Ndebele version, Shandu explains how demographic data suggests that the majority of the Mt Pleasant constituents understand English and Shona. Oh, and apparently there is also an audio version coming in future. Shandu can be accessed on Facebook via this link. I spoke to one of the guys on the development team and he explained that they have translators working on bringing other languages to the bots. Shandu can also handles bookings for programs such as Shanduko Huku Farmer’s training. He did note that right now the bot is still struggling with some of the slang it encounters but he also promised it will get better with time as it learns the habits of users. Apart from Shandu, Mahere also introduced the CODE <MP/> initiative. Last year they hosted their first session and in April they will begin their second class. The initiative teaches coding skills to fifth-grade pupils in Mt Pleasant. Talk about actively impacting the community. I‘ve been invited to one of their April sessions and I’m honestly really hyped to see what the guys are doing so stay tuned for that. Anyway, what was surprising to me is; Fadzayi is the first politician to have a bot that will automatically help anyone looking for information on her and what she stands for. As we get closer to elections you would assume that parties would want their policies and guidelines to be as easily available to anyone looking to make a truly informed decision on who to follow. I run the risk of sounding partisan, but I think the time of politicians merely retorting “[insert name of politician] must go” should be coming to an end. I think other politicians and political parties in the country should follow suit and help voters make more informed choices. I think these kinds of innovations will help increase politicians’ appeal to the youth in our current climate. Yes, other parties may have their manifestos on their websites but remember Whatsapp is the most widespread internet platform in Zimbabwe. To some Whatsapp and Facebook are the be-all and end-all of the internet experience. With this being the reality in Zim, political parties should embrace these platforms and connect with their followers as painlessly as possible. I just used this bot and I believe it is quite immature for it’s purposes. It’s no different from having a static single page website, with sections to Donate via Ecocash, Download Manifesto and a Volunteering Contact Form at the bottom. The **only** upside is being able to use it with FB bundles. A chat-bot is a conversational user interface, and it means just that. The user should converse with the bot. The bot interactions are predominantly just clicking buttons the bot gives you, any other user dialog get’s lost. It doesn’t even respond to greetings. It’s “Meh”, for me. Ideally, they should create user personas of the their intended target voter and get the bot to address possible questions they could have. Such answers could be derived by breaking down the manifesto into manageable smaller bits of information. As well, the bot should collect information and queries. It’s fair and fine to put a manifesto that says, “This is what WE want to do for you”, but that makes the discussion one-sided. Users should also be able to say what they want done for them. The key in politics is to listen to the voter, not tell them what you think they want. In as much as the manifesto could have been draftes from voter input, the voter should be able to give feedback on it, so that they are included fully. Most political parties make the mistake of putting forth their agenda/manifesto and want us to vote for that agenda. It’s still their agenda, not **ours**.